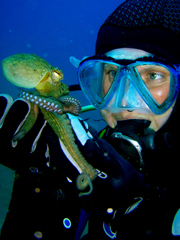 For certified divers La Santa Diving offers diving excursions to different locations around Lanzarote. Each site has a unique character. Also for the qualified diver, safety is our main concern. Therefore Scuba Reviews are available for divers that haven't had the opportunity to practice their diving skills since their last holiday. All divers are accompanied by one of our instructors who will ensure your safety while you explore one of the many interesting dive sites around Lanzarote. Easy access from the beach to a shallow (10m) underwater wonderland of fish and animal life. A large cavern in 30m of water, providing sanctuary for large groupers and other cave dwellers, with a beautiful panorama of the surrounding reefs and drop-offs. Dive down through the reef via an old lava tube at 24m. Follow the drop-offs and explore the caves or simply hang in the blue water and watch the diverse species go by. Choose between the deeper wrecks at 30m or the shallower wreck at 18m where, in summertime, large shoals of glassfish make safety-stops a pleasure! White sand and black lava rocks make this dive site extremely picturesque with visibility in excess of 30m not uncommon. Visit the numerous caves or glide leisurely over the sand to see if you can spot the well camouflaged Angel sharks and Electric rays. From March to June the area is inundated with stingrays looking for a suitable place to breed! The caves around Puerto Moro abound with thousands of prawns that scurry away from the light of your torch. Follow the rocky reefs down to 30m and gaze into the depths of the Atlantic Ocean as they continue downwards. Don't forget to look out into the deep blue water - who knows what may be swimming past! Shallow rocky reefs and sandy patches from 5 - 15 m.
The numerous cracks and crevices provide ideal hiding places for large Octopus and Moray eels whilst playful Wrasse dart amongst the underwater plants and seaweed.